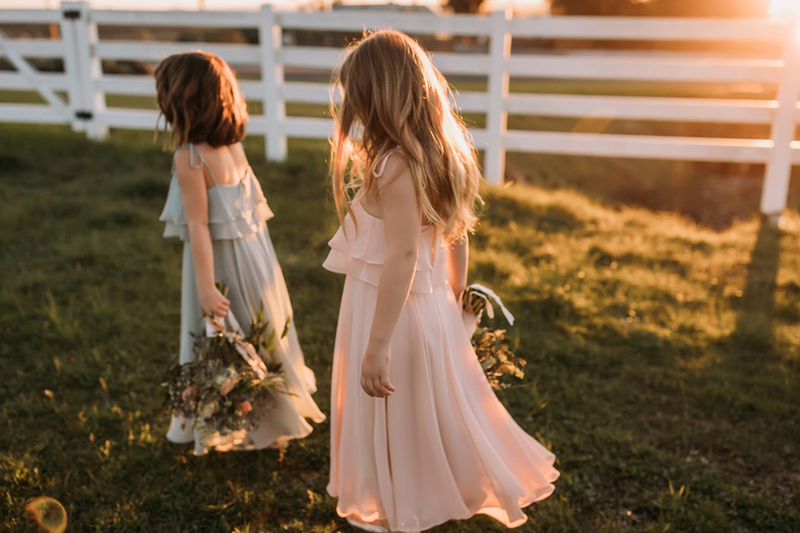 Lily Saratoga also carries adorable dresses for the littlest member of your wedding party. Our designer flower girl dresses are available in various colors with a range of pretty sashes, flowers and bows to compliment your wedding day look. Each style is available in a range of sizes, though they do vary by designer. Q: Do I need to schedule an appointment to shop flower girl dresses? A: Yes! Our fitting room space is limited as is the number of consultants, and our top priority is ensuring each customer has the assistance they need. Q: How does a typical flower girl appointment work? A: Our flower girl appointments are scheduled for an hour, while measurement appointments last for approximately 15 minutes. Your party will have a dedicated Lily consultant for the duration of your appointment to answer any questions you may have and take measurements when necessary. Our historic Saratoga Springs building has limited space, so for the comfort of the party and the bride we recommend limiting parties to 4 people. Please let our staff know how many people you will be bringing so we can reserve the most appropriate space for your party. Q: What sizes are your flower girl dresses available in? A: Each of the flower girl dresses are available in a range of sizes, that vary depending upon designer. Certain designers carry flower girl dresses as small as 12 Month and as large as a size 10. We work carefully to select the best dress size for the flower girl, based on her measurements and the specific designer's size chart. We will also keep in mind that she may grow before the wedding! Q: What if I have flower girls that are not local? A: For out-of-town flower girls, we recommend they be measured. We are happy to ship dresses to out-of-town bridesmaids upon arrival at our shop (a $15 shipping & insurance fee within NYS and $25 out-of-state - dresses shipped out of state are not subject to NYS sales tax). Flower girl dresses must be paid in full for us to place the order with the designer. A: We recognize that flower girls grow quickly, so it is important to not order too far in advance. We recommend placing flower girl orders about 4 months before the date of the wedding. Our designers require 1-3 months for production. A: This will depend on the style and construction of the dress. Some of our designers offer dresses with an elasticized back, which offers more flexibility and stretch compared to dresses with zippers.